Custom Home with New Master Suite on Main. 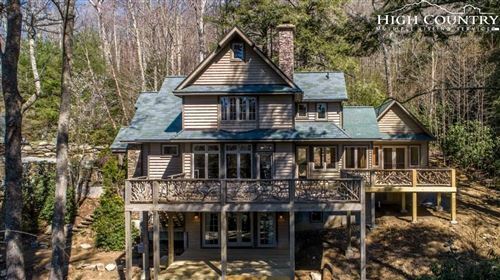 This custom-crafted home, located inside The Farm at Banner Elk, is architecturally designed to fit perfectly into the landscape of centuries-old hemlock trees, wild rhododendron, and a fern-covered boulder. The 1200sq' of deck with rhododendron railing that skirt the house provide for immersive, secluded outdoor living, and the many large windows bring the beauty of this private outdoor setting with its mountain views inside. The open floor plan on the main floor features a warm and inviting stone hearth, open-beam ceiling, several sitting areas, and a kitchen with granite countertops and solid cherry wood cabinets. The new master suite on the main floor has vaulted ceilings and French doors leading out to the deck. Climb the rhododendron railing stairway upstairs to find two large bedrooms, a twin-vanity bath, and two extra rooms for office or play. Downstairs is second master suite/family room/guestroom with its own hearth, large TV with built-in surround sound system, French doors onto a private deck, walk-in closet, and a twin-vanity bath with steam bath shower. This is a one of a kind home that is a must see!